Remember when the Left ridiculed Republicans for the number of presidential candidates who vied for the office? There were so many, the debates consisted of Varsity and Jayvee teams, and candidates jumping the shark to get to the “show”–aka, the big debates. But if you think that was bad, check out what the Democrats have in store, as they have hundreds (457 so far!) of Democrats who filed to run. 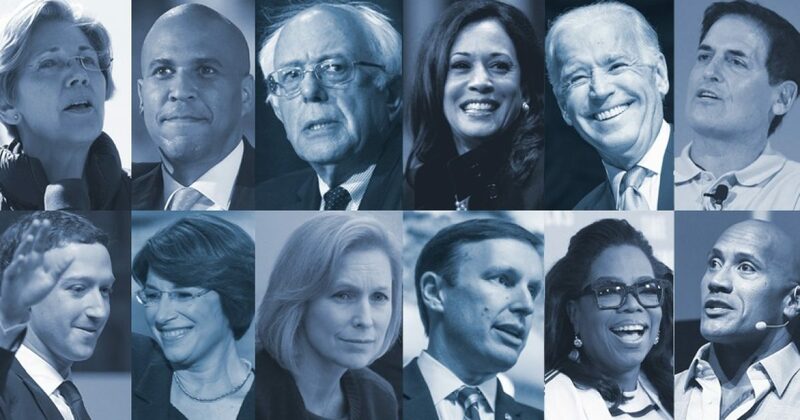 In what would be the largest every crowd running for president, there are potentially 55 prominent Democrats eyeing the 2020 primary — plus 402 other Democrats who have already filed to run. BallotPedia, the encyclopedia of American politics, has just compiled the latest list of major politicians, business executives, climate change advocates, and entertainers who have expressed interest in running. The newest entry is Texan Rep. Beto O’Rourke, who lost his bid to unseat to Sen. Ted Cruz. However, a recent poll shows that he would be a presidential front-runner if stars like Oprah Winfrey and former first lady Michelle Obama decide against jumping in. Pete Buttigieg, mayor of South Bend, Ind. This is for starters, and the list is alphabetical. And it includes everybody from politicos and Hollyweirdos to just plain Leftist weirdos. It’s safe to remove Michael Avenatti from the list, and yes he is on it. Ironically, until his recent troubles, Avenatti was considered a serious contender for the nomination. How sick is that, and not in that new “great” way. The idea that this many people believe they can be a Democrat player proves just how weak the Democrats are. Unlike the Republicans however, even with 402 potential candidates, the Democrats would be hard pressed to find one who is sane. Regardless of who is chosen, he or she will lose to Trump. The rampant cheating will end, as Democrats will no longer control the entire system. But I am curious as to who will rise to the bottom of this list of scoundrels to lead their party further into oblivion. I’m going to make a bet that the person who gets the Democrat nomination will not be a marquee politico. Though I won’t pick Beto O’Rourke, it will be somebody like him–totally incompetent and a new face. We will try to keep you up to speed as people get added or drop off. I’m not sure who can be added, given that damn near every Democrat on the planet has declared. I can’t wait to see the final number of candidates for the debates. There may be more candidates that seats in the auditorium.